INTENSE offers more than the usual school outing. We help pupils to challenge themselves, to work together and explore their boundaries! Fun challenges not only help them work on their independence but also promote group spirit. The feedback was unanimous: everyone had a brilliant day. Thanks! Because we are so satisfied, we have already booked our sports day at INTENSE for the next 10 years! Our pupils and teachers were very positive about this sports day! They all had a great time! We would like to book already for next year. A 24-metre high climbing tower that you can conquer both from the inside and on the outside (perfectly accessible to everyone taller than 1m40). A zip line for the adventure-minded. Possibility to add a rafting course, an introduction to mountain boarding, etc. Discover our offers for schools. 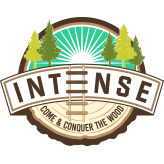 If you would like to come and have a look (and have a go) yourself, contact us via +32 483 17 59 53 or info@intense.be. We will also be happy to put together a tailored programme for an amazing day of fun and adventure.